I've been trying to get used to SL and I'm not even an hour in. Someone gave me an object. I clicked on it and now my avatar looks like a monster. Eyes popping out and everything. Could somebody help me get it back to just a basic avatar? Thank you! To start with, remove and delete the object you were given. Now go to the "Me" menu and slide down to "Movement", and then select "Stop Animating Me." Most deformations like you're seeing are done with special animations. If this doesn't work, go to another region and pick a new avatar from the "Me" - "Choose an Avatar" menu. It can be the same avatar you started with; picking it again will just "clean the slate." I've tried to find the object in my inventory and have failed to do so. I even searched for it and nothing came up. 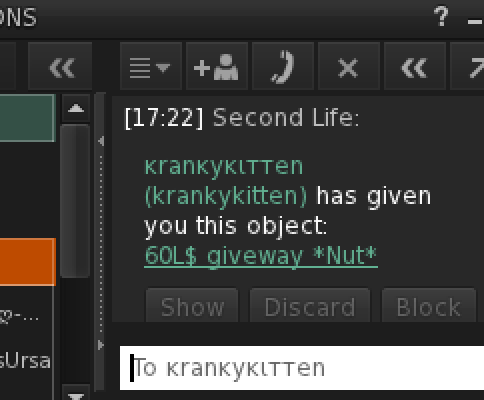 It was an object named 60 L$ giveaway *nut* . Looking back on it I should have known better right? But I had no idea what was going on. Slenderman with the eyes popping out. No problem. Welcome to Second Life! It's a place that has few limits on what people can do compared to most other similar environments. The good part about that is almost everything you'll see was made by another end user. Annnndddd you've just discovered one of the bad parts of that same lack of limits. 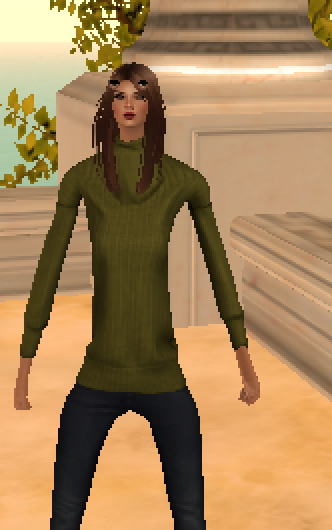 Pff, I doubt you've ever looked bad in SL. Can I interest you in a $600 L Diamond ring? I once accepted some object that made my neck long like a giraffe.